One can know about paaya with the help of Moon in horoscope.In which house/place Moon is situated in our horoscope, through that house we can know our paaya. 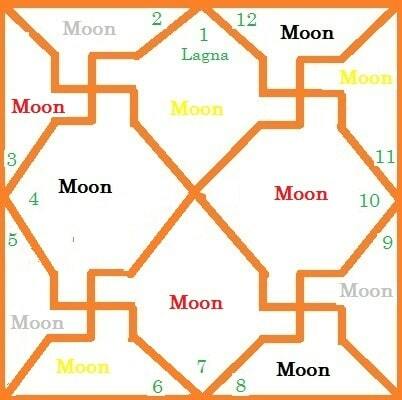 If Moon is situated in first, sixth or eleventh house of horoscope then Golden Paaya.If Moon is situated in second, fifth or ninth house of horoscope then Silver Paaya.If Moon is situated in third, seventh or tenth house of horoscope then Copper Paaya.And if Moon is situated in fourth, eighth or twelfth house of horoscope then Iron Paaya. Fifth and Ninth house of horoscope are called "Lakshmi location".Central locations like lagna, fourth, seventh and tenth house are called "Vishnu Location". When a relationship is made between the owners of the "Lakshmi location" and central locations then that ralationship is called "Raaj Yoga".When owner of central location is in triangle location and in good state or the owner of triangle location is in central location then that yoga is also called "Raaj Yoga". 1 : Having a relation between owner of lagna and fifth house's owner or between lagna and ninth house then Happiness, property, children, age and pleasure are received. 2 : Having a relation between owner of fourth house and fifth house's owner or between fourth house and ninth house then Higher education, wisdom, happiness, land, vehicles, values and respect are received. 3 : Having a relation between owner of seventh house and fifth house's owner or between seventh house and ninth house then wealth, luck and prosperity are received. 4 : Having a relation between owner of tenth house and fifth house's owner or between tenth house and ninth house then attainment of high postition, state, fame, honor, respect, etc. are obtained. (1) When owner of lagna or earnings house owner is in own house/best condition, (2) owner of lagna or earnings house owner is in each other house or (3)luck house owner or fifth house owner is in money house/profit house then Wealth Yoga is formed. Five Master Yog: (1) Ruchak Yoga: When mars is situated is in own Rashi/best condition and in central location then this Yoga is made. Such person is courageous, hard-working, rich and reputed. (2) Bhadra Yoga: When mercury is situated is in own Rashi/best condition and in central location then this Yoga is made. Such person is happy, wealthy, and reputed. (3) Hansa Yoga: When jupiter is situated is in own Rashi/best condition and in central location then this Yoga is made. Such person is lucky and learned. (4) Maalvya Yoga: When venus is situated is in own Rashi/best condition and in central location then this Yoga is made. Such person is of Artistic interest and receives wealth. (5) Sasa Yoga: When Saturn is situated is in own Rashi/best condition and in central location then this Yoga is made. Such person receives land, houses, values and respect.